This little fellow was watching me yesterday as I was reading. I love the face and the sunglasses. I’ve tried to make this picture bigger for you but alas, my technical skills on this computer are so crap that all I can offer you is this pimple sized picture. Maybe if you use a magnifying glass it will help to see the extraordinary detail on the wings and body. This beauty was in the bathroom. I’m still waiting to get a good shot of the lizards and the geckos that are all over the kitchen floor and ceiling. They lie in wait for their pray, then lickety split, their long tongues snap up the unsuspecting mosquitos or fly that’s landed too close. The lizards are very territorial and if one creeps over into another one’s patch, there is a lot of squabbling and arguing. They can make quite a noise if they get annoyed. That’s very kind of you to say so! and thank you but I am still feeling very pissed off that I couldn’t get it any larger on the blog. When I went into photoshop and enlarged them, they were, hmm though I say it so myself….Magnificent!! That is just spooky. When i can use big computer again (i.e. when screen does not burn out my retina), i will enlarge the head section for you and repost. I would have had LSD type nightmares after seeing that , or wonder if there was an indonesian man going about with a dragon fly head. It’s so annoying as I can enlarge them on photoshop and the quality is wonderful. Maybe it’s just WordPress, but then on the other hand I see lots of blogs with HUGE photos on them so I suspect it’s just my incompetence 😦 anyway, I really loved these bugs, the face of the first one is extraordinary, sort of alien wearing designer sunnies? Thanks B, if you can sort it I’d be really happy! Hope your eye gets better soon. I thought they looked great and I’m seeing them on my iPad! Aww, thank you Martha! A friend on Fbk, read this post on her iphone and she said that she could enlarge the pictures and see the details which I’m really happy about, and I’m guessing that this is what you were able to do on your ipad. I’m sure I’ll work out how to get larger photos on WordPress eventually, it can’t be that difficult!! I can enlarge the photos on my laptop, too. No worries, Lottie, I think the photos turned out fabulous. 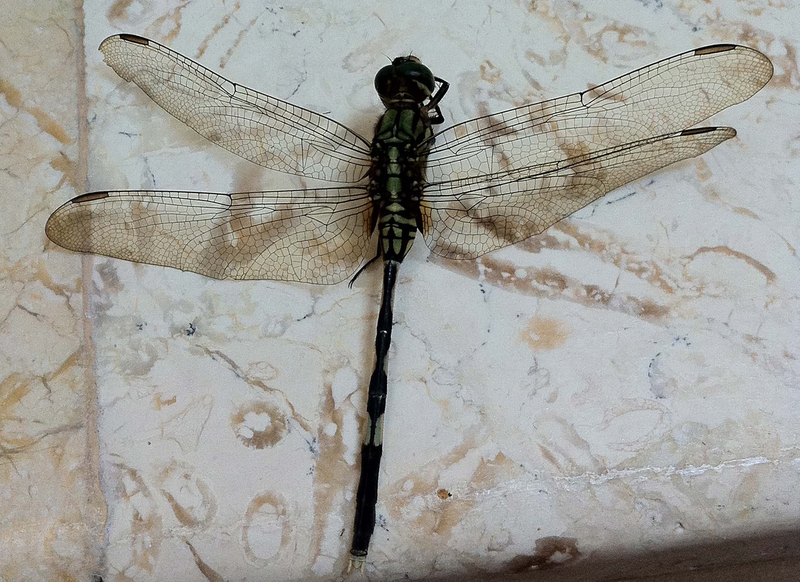 I absolutely love dragonflies. There’s a Native American tale about how dragonflies were at one time dragons, but Coyote (who is their version of Loki) tricked the dragons into shrinking themselves and they weren’t able to change back. Whenever I see dragonflies flitting around, I always think of this tale. Can’t wait to see your lizard and gecko photos! I had no idea that they were territorial. That must be an interesting (daily?) occurrence for you! Hi Lottie, I’ve just enlarged them too and the first one is amazing! Looks like a little old man sunbathing! Woo hoo, I’m so happy that you can get ‘the bigger picture’ so to speak. I think it’s amazing, the detail on the body, wings and face? incredible. I just love it’s expression, sort of alien, totally weird. The sunglasses? whats that about! I was so lucky that this dragonfly was just happy to pose. Normally they are skitting about and difficult to capture on camera. Love the pix… and I love living among the butterflies, geckos, spiders and more… I was even kissed by a dragonfly awhile back 🙂 Don’t you just LOVE the nature in Bali?! Thank you! Yes, I adore the nature in Bali too and my eyes are almost permanently out on stalks at how beautiful everything is when you get away from the tourist areas and go out into the country and the mountains. I could spend my life here just walking, photographing and drawing and painting….heaven! I just love dragonflies! These are great photos. I used to be afraid of them, when I was very young, because I believed the stories about dragonflies zipping naughty children’s mouths shut. I guess I thought I was naughty enough for that! Hell’s bell’s I never heard that one before…zipping children’s mouths shut!! 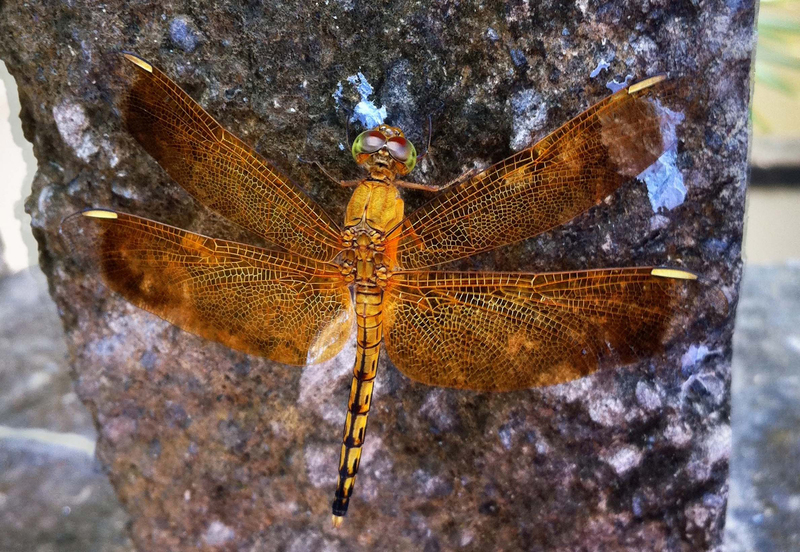 I love dragonflies too, they are extraordinarily beautiful. Thanks for your lovely comment!